Though up to this point we’ve only had a leaked rumor of Google’s date for this year’s hardware event, the source was so solid that we simply assumed October 5th was a rock solid assumption for this year’s festivities. It looks like there’s a chance that rumor was a bit off, if only a bit. 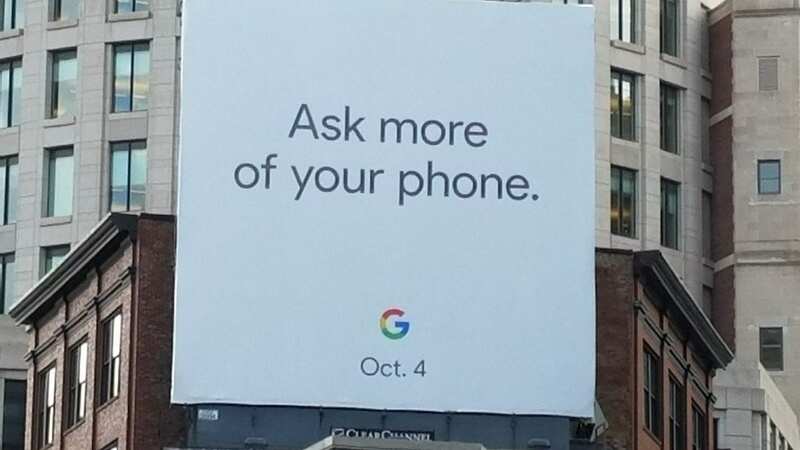 Granted, this firmly in the speculation department as well, but a tipster over at Droid Life has turned in a pic of a billboard in downtown Boston that bears only the words Ask More Of Your Phone and the big Google G.
Thinking about the fact that last year’s big event – and the introduction of #madebyGoogle – happened on October 4th and was first advertised in a similar fashion, we have our first hint that this could be real. Also, the original leak by Evan Blass pointed to an October 5th date, only one day different than this new date in question. We know early October is Google’s standard window for events and with the combo of last year’s date and Blass’ original forecast, I think we could very well be looking at another October 4th event. If you are keeping tabs, that’s 3 weeks. 3 weeks until we meet ‘Eve’. 3 weeks until we see the new Pixel phones. And 3 weeks until the next generation of Chromebooks truly begins.